A flashlight is a portable, battery-operated device used for illumination. A typical unit consists of one or more dry cell batteries arranged in a line inside a battery compartment that forms the handle of the light. The flow of electricity from the batteries to the bulb at the front end of the light is controlled through a switch mechanism placed between the batteries and the lamp. Practical, portable light sources have been sought throughout history. Torches and candles were early sources of light but these were largely replaced with lanterns as people learned to burn various animal and mineral oils. However, it was not until the nineteenth century that electricity was harnessed to create light. The modern battery powered flashlight was created in 1898 by Joshua Lionel Cowen, the original owner of the American Eveready Battery Company. Cowen originally developed an idea for a decorative lighting fixture for potted plants. His fixture was composed of a metal tube with a lightbulb and a dry cell battery. Cowen passed his idea to one of his Eveready salespersons, Conrad Hubert, who turned the metal tube, lightbulb, and battery into the world's first flashlight and started selling the batteries and the flashlight. In the last hundred years, advances in technology have resulted in flashlights with hundreds of different styles and features. For example, flashlights are now made with rechargeable batteries that can be used multiple times. Other lights are designed for special operations, such as working underwater or in high-temperature conditions. The most common flashlight design is the simple household light that consists of a tube-like handle that contains the batteries. This handle is affixed to a threaded head assembly that houses the bulb mechanism. These units operate on standard batteries and provide a typical light output. Special designs are required for industrial or professional use. These lights are made from heavier gauge materials, and are more durable. They are also intended to produce a brighter beam of light. Flashlights with brighter beams are used by the police, firefighters, and the military. Camping lanterns are larger units, usually powered by heavy duty batteries. These frequently use fluorescent tubes as their light source because of their greater energy efficiency, however, this type of bulb does not cast as strong or directed a beam of light. Furthermore, the increased size and weight of this type of lantern limits its portability. Novelty flashlights are designed for use by children. These tend to be made of lightweight plastic and are notable for their visual design. The body of the light may be adorned with decorative plastic overlays that increase the child-appeal of the unit. Their designs are often based on favorite characters from popular cartoons or children's books. Finally, there are a variety of specialty lights designed for particular uses. For example, snake lights, flexible tubes that can be bent or twisted to provide light in hard to reach places. Others are designed to be small enough to fit on a key chain to illuminate keyholes. Factors to consider when designing flashlights include light output, durability, and the ability to operate in special environments. Battery life is also an important factor, and some lights are designed to be plugged into an electrical outlet to be recharged or to maintain a charge until it is needed. Other lights use special bulbs, like the new generation flashlights built with light-emitting diodes. These are not as bright as conventional incandescent bulbs, but their power consumption is so low that they can last hundreds of hours on a set of conventional batteries, as compared to a few dozen hours for incandescent bulbs. 1 The plastic components used in flashlight construction are typically injection molded using polystyrene and other durable polymers. In this process, plastic pellets are mixed with plasticizing agents and colorants. This mixture is liquefied by heating and then injected into appropriately shaped molds via an injection plunger. The mold is then subjected to high pressure to assure that the molds are completely filled, and to hold the molds together against force of injected liquid plastics. The end closures are also molded, where usually both internal and external threads are molded. Pressures as high as 2,500 tons may be used for high-speed or multiple-cavity production molders. 2 After the injection process, the molten plastic is cooled by forcing water through channels in the mold. The plastic hardens as it cools and the pressure is released. At this point, the two halves of the mold are separated and the plastic part can be removed for finishing. The plastic polymers used in this process are thermoplastic, meaning they can be repeatedly melted so the scrap pieces can be reworked to make additional parts. Therefore, there is very little wasted plastic in this process. Subsequent operations may be required to polish, cut, and finish the plastic parts. 3 Incandescent bulbs are the most common light source used in flashlights. These consist of a metal filament sealed in a glass bulb. When the filament is exposed to an electric current the resistance of the wire causes it to heat up and emit light in the visible wavelengths. The filament is welded to two wires that pass though holes in a cylindrical glass bead that forms the base of the bulb. This structure is placed in a fixture and a cylindrical glass envelope that is closed at one end is placed over the filament. The open end of the glass envelope rests against the glass bead. 4 The structure is placed inside a vacuum chamber and heat is applied to seal the glass envelope to the glass bead. The heat causes the glass to soften, and may cause the filament to be displaced to one side. Therefore, care must be taken to ensure the filament is properly aligned or the bulb will not project a beam of light in the right direction. Other possible light sources include fluorescent bulbs, which are often used in camping lanterns. These bulbs emit light due to the excitation of gas molecules inside the bulb. LEDs, or light emitting diodes, are used in some specialty lights; these emit light when exposed to extremely low levels of electric current. The bulb is often fitted in front of a polished aluminum reflector that helps to focus the light during operation. 5 The electronic circuitry of a flashlight varies depending on its design. Simple lights rely on an off/on switch to make the connection between the wires connecting the battery terminals to the wires extending from the base of the bulb. This type of switch is most commonly a slide type that moves up or down to make the proper connection. The switch assembly is more complicated in the more sophisticated lights. One United States patent describes a flexible metal strip that is depressed to create a contact between the wires. 6 Depending on the design and the manufacturers capability, units may be assembled on an automated conveyor line or by hand. Some models, particularly those using small watch batteries, have the battery inserted during assembly. Otherwise, the unit may be assembled without the batteries that are inserted later by the consumer. This operation involves screwing the lamp assembly onto the threads on the casing. 7 Assembled units may be placed in some form of outer packaging, such as a clear plastic blister pack or clam shell. The plastic shell may then be attached to a cardboard display card or packed in a box prior to shipping. Completed flashlights undergo a series of quality control tests to ensure they function properly. First, the bulb must be checked to ensure it is properly aligned with the reflector; if it is misaligned performance may suffer. Second, the switch assembly is evaluated to determine if it makes proper contact with the electrical leads. Third, the seal on the battery compartment must be checked to determine if moisture will not inadvertently enter the battery compartment. This seal must allow venting of gasses that may be formed during battery operation. The bulb itself must meet separate quality standards. Generally, Division 2-approved flashlights are temperature-rated as TI to T6, where Tl is a temperatures less than, or equal to, 842°F (450°C) and T6 is less than, or equal to, 185°F (85°C). Testing labs used by flashlight manufacturers include Factory Mutual Research Corporation, Underwriters Laboratories, and Demko. Any flashlight that will be used in a hazardous environment or confined space must be properly tested to ascertain that it meets or exceeds all applicable safety standards for those locations. Hazardous Locations are defined by the National Electric Code and include the following classifications. Class I locations are areas where flammable gases may be present in sufficient quantities to produce explosive or flammable mixtures. Class II locations can be described as hazardous because of the presence of combustible dust. Class III locations contain easily ignitable fibers and filings. Hazardous atmospheres are further defined by "groups." These include atmospheres containing acetylene, hydrogen, or gases or vapors of equivalent hazard, such as ethylether vapors, ethylene, cyclo-propane, gasoline, hexane, naptha, benzene, butane, propane, alcohol, acetone, benzol, lacquer solvent vapors, or natural gas. Metal dust, including aluminum, magnesium, and their commercial alloys, may also create hazardous atmospheres. Environments containing carbon black, coal or coke dust, flour, starch, or grain dusts, are classified by the Code. Flashlights designed for use in these environments are individually tested before leaving the factory. Manufacturers continue to improve upon the design of their flashlights. New models with improved power sources are becoming increasingly popular. 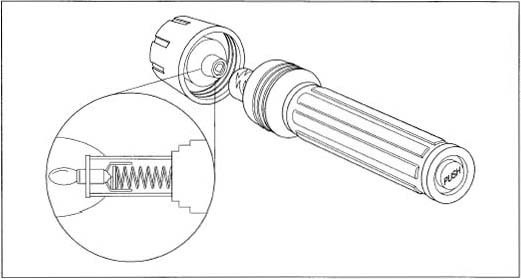 For example, the power plant of a new self-powered flashlight is the revolutionary Freeplay Generator, which is a unique and patented mechanism that stores kinetic energy in a carbon steel spring as the user turns a winding handle. This energy is released as electrical energy when the light is turned on, thus powering the light without any other external power source. Other improvements in flashlights include tougher polymers for improved durability and smarter computer technology that will allow automatic shut off mechanisms to conserve battery life. Finally, increasingly sophisticated molding techniques will allow the creation of novelty flashlights in a wider variety of shapes and colors. Ahmstead, B.H. Manufacturing Processes. New York: John Wiley & Sons, 1977.